Hi guys! It’s been years now since I first made my simple Rainbow Cake here on Kerry Cooks, and in that time, Rainbow Cake’s have become even more crazily popular! BBC Good Food even featured one in their magazine (although it’s apparently not nearly as reliable as mine, judging by the reviews!). 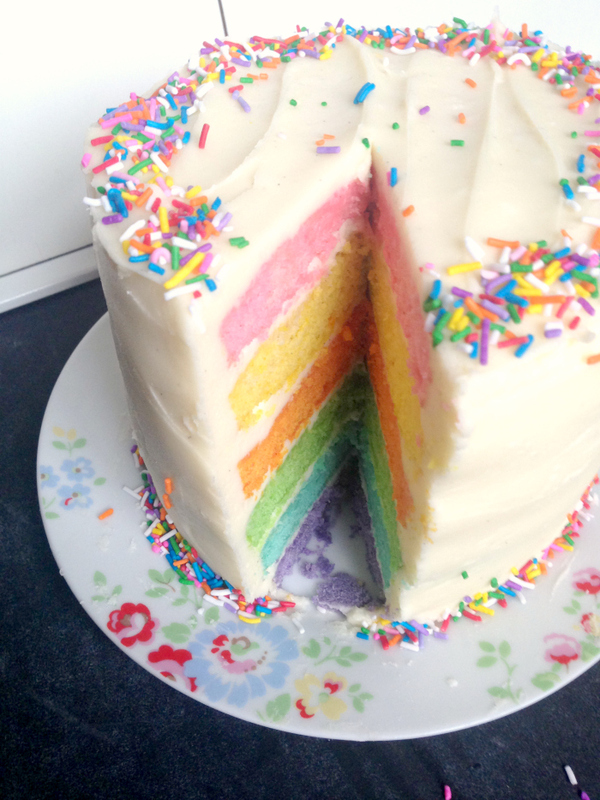 If you’re thinking of making one, rest assured that Rainbow Cake can be easy and stress free. My recipe is a simple Victoria Sponge recipe that’s been adapted for bigger quantities. Once made, the batter is divided into six and the colouring added to give the bright rainbow layers. HUNDREDS of people have made it with great success – check out the comments! What type of food colouring should I use? As mentioned in the recipe post, I normally stick to Sugarflair for every colour except purple (Sugarflair’s grape violet is too dull in my opinion) – I use Americolor’s Electric Purple instead. If you have a specialist baking supplies shop nearby, you should be able to find gel colours for between £2.50 and £3 per pot. Failing that, you can buy sets of gel colours specifically for Rainbow Cake’s from eBay, and other online shops too – I recently bought some Americolor’s from Fair Cake. I wrote a whole post on the subject of colouring cake sponge here. Is food colouring dangerous / can I overdose on it? If you’re concerned about consuming the E numbers and artificial bits and bobs in gel food colouring, do not make a rainbow cake. Could I add other flavourings to my Rainbow Cake? Yes! You could add a flavouring extract such as strawberry, almond, lemon, or even something more exotic like bubblegum. What size cake tins did you use? I used 6 inch disposable ‘flan cases’ to bake my cakes, which I bought from Wilkinson’s (UK). 6 inch tins is why my Rainbow Cake was so very tall! Depending on how tall you’d like your cake to be, 6, 7, or 8 disposable tins would work great – you’d just get either a taller or less tall cake. If you want a cake that’s bigger than 8 inches, you’ll need to scale up the recipe. Lots of supermarkets and pound shops sell disposable cake tins too, so stock up whenever you see them. I even re-use mine, with a quick rinse and turn in the dishwasher. How did you prep the tin foil tins before using? The great things about disposable tins is that cakes seem to come out of them really easily. I simply prep by brushing melted butter around the bottom and sides of the tin (alternatively, you could use a cake release product). If your cake does get stuck, never fear, simply cut the tin foil sides of the tins at about every inch, and then flatten the sides – you should then be able to get a palette knife under the cake to loosen it. How high will my layers rise? The layers should be between 1 and 2 cm high, depending on what size tin you use. If your cakes don’t seem to have risen, troubleshoot by checking your self-raising flour – is it well within date? You should also try to get the cakes into the oven as soon as possible once the flour is added to the batter – not easy given that you’re dividing it into six and adding the colours, but work as quickly as you can. Can you make the layers ahead? Yes! In fact, if you can make them one or two days before you want to serve your cake, its ideal. When a cake is freshly baked, it’s very crumbly and difficult to stack. I recommend baking your cakes, wrapping them in clingfilm and popping them into the freezer, and then unwrapping and decorating the next day. It will make decorating so much easier, trust me! Is it okay to leave the batter to sit while I bake three cakes? 6 disposable cake tins between 6 and 8 inches should fit easily into a normal sized oven with three shelves. If all of your tins can’t fit into the oven at once, there’s no harm letting half the mixture sit as long as it’s for a fairly short time (your cakes should be cooked in around 15 minutes). Cake mixture shouldn’t sit around for too long once the flour has been added, or the cake will become tough when cooked. Does the frosting set firm? The cream cheese frosting I recommend will set firm to the touch, although it may need some help from the fridge on a very hot day. When you’re decorating the cake, you’ll need to apply multiple layers of frosting, setting in the fridge. I’m having problems with my cream cheese frosting, any advice? Cream cheese frosting can be tricky – I wrote a whole post on how to get it right. This method is so easy and it has NEVER failed for me! Could I use another type of frosting to cream cheese frosting? Of course! It’s your Rainbow Cake. You could also use a buttercream, or perhaps a chocolate frosting. It would be really nice to try one flavoured with strawberry or cherry extract too. If you’re not too confident with baking, you could even buy a pre-made frosting. Or you could even use jam. Lots of Rainbow Cake recipes also recommend a Swiss Meringue Frosting, which is also white and popular due to not being overly sweet. If you’d like to give it a go, try this recipe by the reliable Annie’s Eats (you’ll want to double the quantities). Could I use less sugar in the cream cheese frosting? Definitely! Any frosting recipe is a guide – I normally add sugar 100g at a time until I’m happy with the sweetness and thickness. How should I decorate my Rainbow Cake? Excellent question! The answer is – however you want! I love a smooth, plain white finish (to which you can add rainbow coloured sprinkles if you want) which doesn’t give any hint to the cake inside, so that when it’s cut, its a magical surprise! This is also the most low-maintenance method of decorating your Rainbow Cake. It is possible to cover your cream cheese frosting in fondant if you’d prefer too. If you’d like to experiment with your decoration, check out my Rainbow Cake board on Pinterest for more inspiration! The rainbow ruffle and rainbow fondant heart cakes are especially awesome. Do I need to use dowels to support my cake? My cake didn’t have any support from dowels, and it always holds up just fine. Cream cheese frosting is very sticky and holds the cake together well. However, when you’re building your cake, I recommend sticking it to your cakeboard/serving plate with a little cream cheese frosting ‘glue’ and building it two layers at a time, popping it into the fridge for 20 minutes each time to allow the layers to set firm before adding more. How should I transport my Rainbow Cake? I transported mine in a large shopping bag (the big bag for life types from Marks and Spencer) and it did get a little knocked en route (on the BUS!). If your cake needs to be transported, I’d recommend a taller cake carrier (Lakeland and cake supplies shops do some lovely ones). Do you have any other Rainbow Cake questions? Let me know what they are in the comments and I’ll do my best to help! Filed Under: Baking, Rainbow Cake Tagged With: faqs, rainbow cake! Hi Kerry has the rainbow cake recipe already been adapted to make the 6 layers.. or should I double the ingredients myself?? Hi Kerry, could i do a white chocoalte ganache on top or Do you think that will ruin the frosting? Hi Elizabeth, no a cake can’t dry out in the freezer – being frozen keeps them fresh. I haven’t tried marshmallow fondant on the cake but it sounds delish! hi, do you think I can use some jam/fruits/berries in between the layers? Hey Anna, definitely! You could use anything you would put in any cake – whipped cream and fruits, or stick with the cream cheese frosting and add jam and fruit too. Hi, How many days can a cake last in the freezer? for example if I make the cakes on a Monday, freeze them and decorate on a wednesday to be served on a thursday (in the office) would that work or would the SPONGE go stale? I want to bake this for my son’s birthday.Can I frost this with whipping cream and keep in fridge fully set to use for next day evening?Will it hold?Also I am planning to bake it in a large disposable roasting tray from wilko as i need it for around 35 people.What amount should I use please. Hi Genna – I’ve never frosted it with whipped cream, so I don’t know how long it will take to set. In the Rainbow Cake post, there’s some guidance on scaling up your recipe – I’d advise tripling it to make sure you definitely have enough mix. Thanks a lot for the reply….I made it and no need to say it was a huge hit..Made some cup cakes along as well to make sure it serves for all…………..I wish if I could post the pic……. Hi! Im planning on baking this f my daughtErs birthday party bug was thinking about a 9″ tin, how would i adjust the quantities? Thank you! Hi! I just tried a 9 inch using the quantities suggested ÷6 ×7 and I have 6 very thin sad looking cakes! ☹ do you think this was due to the size or OVERMixing…? Wanted this for my husband’s 30th but so far not looking promising!! I was following your recommended timeline so do have TIme to try again.. So sorry to hear that! Try doing it x 8 or even 10, then if you have a bit more batter than you need you can just make a few rainbow cupcakes. Hi ive been meaning to reply as i made the 9″ cake foR my daughters birthday and it worked amazingly. I have to say i started out feeling a bit worried as it just fidnt Look like enough mixture, and they do look rather thin and flat , however the magic happens when you stack them all up- it actUally ends up being a pretty substantial cake! I cheated and used betty crocker buttercream (i used 3 tubs! Half a tub between each layer then half a tub as a crumb coat Before covering with roYal iCing. It looked sTunning when it was cut open and i had so many compliments! Looking forward to Trying Out This Recipe =) I wAS Wondering If This Could Easily Be Adapted To Make A Piñata Cake? Re the frosting – you could do melted white or milk chocolate, if she likes chocolate – on the outside. On the inside, maybe fresh cream and strawberries if she likes that? Otherwise, I’m at a loss! Hey Ruth – that timeline sounds perfect! When you’re finished decorating, I’d put in fridge, then bring out around an hour before you want to serve. When you divide the batter into 6, and colour it, you’ll find that each one fills the tin foil cases around half full 🙂 Good luck! Can i use normal All purpose flour or cake flour instead of self raising flour. Hi Stella – I believe cake flour does not have a raising agent, it just has some corn flour added – so you can’t do that. Hi. HOw much would the batter approximately weigh after adding all the ingredients? Around How much BATTER would be in each cup when divided by 6? I am using high quality food COLOURING paste for my rainbiw caKe but cant get A good purple sponge! My purple sponge comes out orange after baking what am i doIng wrong?? Its a lovely colour purple mixture until its cooked then when i cool it and cut tound edge its orange inside!!! Help!! gosh my spelling; I mean DRY out! I’ve used your recipe a few times and each time they’ve come out perfect, thank you! One question, can I use your cheese frosting recipe and put fondant over it? I’ve read that it’s a big no no but I’ve also read as long as it crusts then it’s ok. Can you advise? Thank you! Hello! Lots of my readers have told me that they’ve done just that and it’s worked perfectly. The only time I might worry is on a really hot day. Good luck! I’m going to make your rainbow cake for my daughters 18th birthday so want to pipe and decorate it up.Do you think I can put roll out icing on top of a thin layer of the frosting so it’s easier to decorate. Hi Lisa, you just need to increase the ingredients by 65g for the flour, butter, sugar, and one egg. Enjoy! I’M really excited to be making this cake next week! But due to work / children i really only have one day to do it in (and really only 9-3) whilst children in school. Would it be ok to freeze the cakes just for a few hours? I plan to decorate with buttercream. Thank you. Hi Steph – absolutely! Even a few hours helps firm it up and make it easier to frost, since freshly baked cakes are so crumbly and easily break. Good luck with the cake! HI I plan to make this cake for my daughters birthday and was wondering if I make it a couple of days before and freeze it do I take it out the freezer the night before or on the morning of her birthday and do I leave it to defrost before decorating or what works best? I want to make this cake for my son’s birthday party. But wE will have at least 35-40 people. How can i make it bigger? Will baking it in an 8inch form make it big enough? I am going to attempt rainbow cake, how many days can I freeze for? I was hoping to do it 4 days before the party? Hi , i have to make a naked rainbow cake but thd outsides of my cake keep changing color there losing there vibrancy. I was thinking that maybe my oven is to high i cooked them on 180. Any help would be greatly appreciated. Hi Karen, just be sure you’re cooking on the middle shelf of the oven and keeping a close eye on them – I rotate them in the oven and make sure that they are cooked, but never browned. Hope that helps! Good luck Lisa! I’m sure you’ll do great. Buttercream should absolutely be stiff enough for the cake, and gummy bears should look really cute! Where will I get my rainbow colours?? There are links in the post to where I buy them from – scroll up! They’re in the rainbow cake post! I ordered ordered Sugarflair cake colour powder the other day, do you think this will work as well as gel? I was hoping it would help with the consistency of the cake as oposed to wet colourings but now i’m worried about how vivid it will be. Hi Kerry – there’s no need to worry about that, since it will already be protected by a thin layer of cream cheese frosting the first time it goes into the fridge. Hi, I’ve just baked my cakes and I’m leaving them overnight. Did you trim them down or level them out at all before putting the frosting on? Thanks! Hey Buddy!, I found this information for you: "Baking a Rainbow Cake – Frequently Asked Questions". Here is the website link: https://kerrycooks.com/rainbow-cake-frequently-asked-questions/. Thank you.